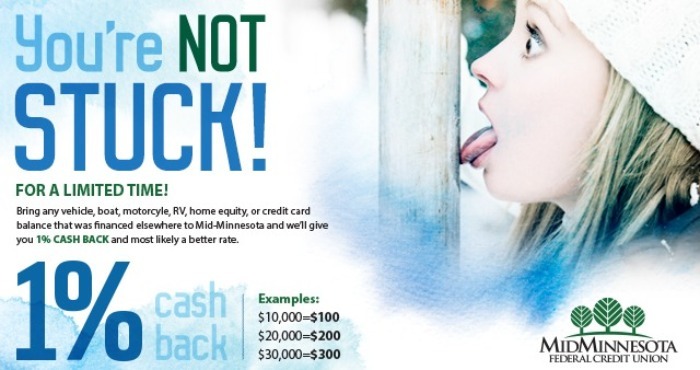 For a limited time, bring your loans to Mid-Minnesota from other financial institution for an opportunity to receive a competitive rate, a comfortable monthly payment and cash in your pocket! $60,000 refinanced- earn $600, you get the point! For more information regarding our qualifying loan types! Contact Member Services at any of our branches if you have questions, or to apply in person or over the phone. All loans are subject to credit approval and certain restrictions apply. 1% cash back may be reportable income. First mortgages, business and student loans excluded.